Those of us who have lived in Gwinnett for any length of time know that we have really short springs. Cool mornings and temperate afternoons will suddenly end, sending us into a routine of enjoying outdoors during brief cool mornings and staying inside during long sweltering afternoons. So plan for the expected and get those yards and gardens cleaned up and planted now. This month's issue is again full of all sorts of info on what’s going on in greater Lilburn with a focus on family activities, businesses and ways to get involved in helping groups support worthy causes. While you may not get through this issue in one sitting, keep in mind that you can always find this issue and others on the Blog page of the Lilburn Community Partnership website www.lilburncp.com where it can be translated online. As always, we welcome your pictures and ideas for articles or additions to the website Bulletin Board page at info@lilburncp.com. Taste of Lilburn Was Awesome! 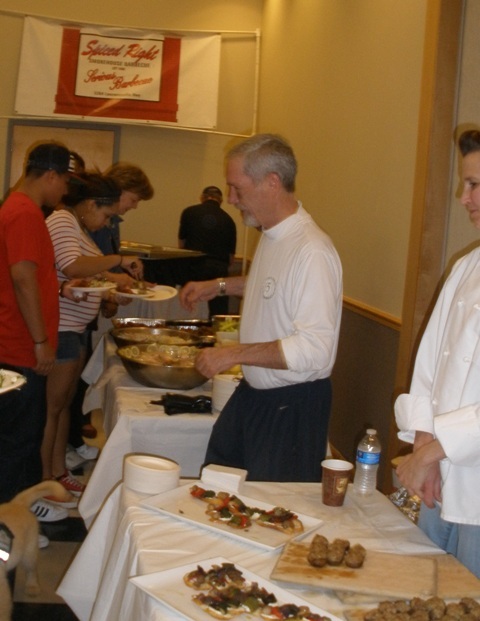 Lilburn Community Partnership’s first Taste of Lilburn event on Saturday, March 22 was a food lover’s paradise. Lilburn City Hall auditorium was packed as the event was a sellout with over 140 tickets sold. Attendees enjoyed: Wine and Chicken Waffle Sliders served by 1910 Public House; Chicken Parmigiana, Meatballs, and Cannoli by Bambinelli’s; Assorted Chicken Wings, Shrimp Cocktail and Salad Greens by Oyster Barn, Shrimp Corn Dogs by Rivals on Five; Pork and Beef BBQ sliders by Spiced Right BBQ, Tres Leches Cake by Taqueria Los Hermanos, and Sausage Stuffed Mushrooms and Vegetable Tartiene by Three Blind Mice. Volunteer organizers were delighted with the turnout and the almost $2,000 raised that will benefit the Wynne Russell Historic House. LCP is so appreciative of the restaurant owners and chefs who donated their time, talent and food to make this a great community event. Please consider patronizing these local restaurants in the future. The LCP's Business After Hours was held at the Lilburn Community Garden on Thursday, March 20. Attended by several residents and businesses operators, it was a treat to see the gardens up close and hear from Peggy Bergman and other gardeners regarding their plans for the future. Phase II is now open for 22 additional plot rentals. 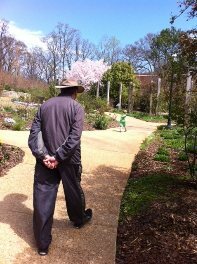 Check the website for info: Lilburn Community Garden. Doug Dorough of Dorough landscape and Jeremy Myers of MMG as well as master gardeners were on had to give tips to attendees. Ms. Bergman pointed out the garden and constructed plot beds that contributed by Boys Scouts. She also shared future plans for a gazebo for some shade on sunny days. Door prizes and refreshments and were provided by Kroger, Dorough Landscape, Crossfit Gym, 1910 Public House and LCP. The next Business After Hours will be held May 15, 5:30 pm - 7:00 pm at the City of Lilburn's new Public Works Facility located at 4428 Lilburn Industrial Way. City officials will be on hand to update attendees on City projects and future plans. BAH is free and open to residents and business operators. Businesses are welcome to bring a door prize and will have the opportunity to introduce their business as they host the drawing. For more information, contact info@lilburncp.com. For past BAH photos, check the LCP Facebook photo album. Mandir Puts Lilburn on the Map! 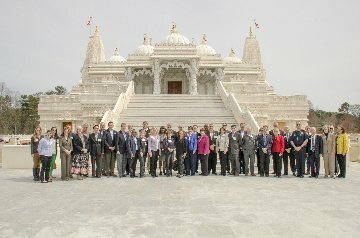 Additionally, the LCP would like to congratulate the leaders of the Mandir for having received the Gwinnett Hero Award. Explore Gwinnett hosted their annual tourism awards luncheon and noted "This year the BAPS Mandir hosted Gwinnett's largest visiting group on record. The Mandir played host to a Hindu Youth Convention that brought 10,000 students to Gwinnett over the course of three weeks. The Mandir's welcoming and flexible staff made it possible to host this large group and to give them a positive experience in (Lilburn) Gwinnett." Attention organizations and residents. In anticipation of renting spaces for monthly yard and craft sales at the Wynne-Russell, the Lilburn Community Partnership is seeking volunteers to come to a morning grounds clean-up on Saturday, April 19, from 9 am until noon. Organizations or individuals who donate their time for three hours will receive a free space for the first sale on Saturday, May 5. Plan to bring gloves, clippers, rakes, sun screen, etc. Water will be provided. The house is located at 4685 Wynne Russell Dr. Contact info@liblurncp.com to sign up. 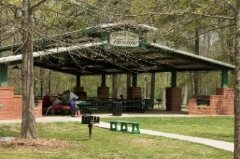 The City of Lilburn is taking spring and summer reservations for Gartrell Nash Pavilion in Lilburn City Park. Also, don't delay reserving a space for the White Elephant Sale to be held on Saturday, June 21, 9 am - 2 pm. The City is discontinuing its seasonal garage sales, as it adds other events to its calendar. Check the Lilburn Community Partnership Bulletin Board for an announcement regarding dates for monthly garage sales beginning in May 3rd at the Wynne-Russell House. Saturday, April 26 will be the Great American Clean-up in Lilburn. Check this LINK for a list of recycling items and a fundraiser for Parkview Christian School. Other City events that are in the works are: Several community Fun Runs, Pawfest on May 10, Hiking and Hotcakes to Cure Scleroderma on June 14, Sparkle in the Park on July 4, and National Night Out on August 5. Check the City web site LINK. 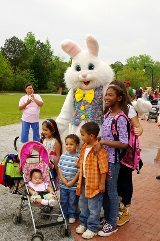 The Downtown Development Authority will once again host its annual Easter Egg Hunt in the park on Sat. April 12 from 10 am until noon. Sponsors are still needed for this event. Click on this LINK to download details. For event details, click on this LINK. Plans are being made for Small Town. Big World: Lilburn International Festival to be held in Lilburn City Park on Saturday, September 13. The Lilburn Community Partnership's event committee is led by Board Member Rick Desai. SafetySmart Lilburn recently voted to co-host with LCP creating a strong alliance to ensure success for this first event. The event committee has been meeting and has commitments from several organizations to participate in the planning. The LCP would like to encourage businesses and organizations in the greater Lilburn area to come forward and support this event with sponsorships, vendors, entertainment, volunteers, participants and attendees. Save the date and contact info@lilburncp.com if you would like to help make this event a community success. Check LilburnEvents.com and Facebook for updates. Lilburn Girl Scout Day Camp has been going strong in Lilburn City Park since 1982. Many of the leaders of today were young campers when it started. 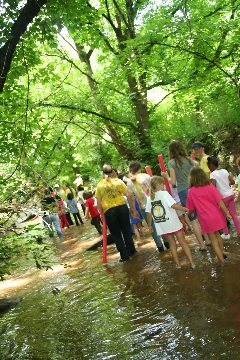 Every June for a week the park is transformed by 350-400 girls and 100 adult volunteers. The themes change every year and this year is "Fine Arts Academy." What a wonderful tradition that has continued for 32 years. Now is your chance to sign up your daughter for camp - not a registered member of Girl Scouts? You can be for the first week in June, but get registered soon as this camp has limited space and fills up quickly. Follow this LINK for important information about the camp and mark your calendar for Saturday, May 3 when prospective campers get to meet the leaders and their unit. A big thank you to the parent volunteers who have continued this wonderful service to our Lilburn community. The Lilburn Woman's Club will be selling tickets soon for "Behind the Garden Gate" tour of Lilburn area gardens. This inaugural tour, from 9 am until 3 pm on Saturday, June 7, will showcase 8 private gardens that are will give you a close-ups of true treasures that creative homeowners are sharing during this not-to-be-missed event. Tickets, $20 each, will be available from any LWC member starting in April. Also, LWC has just received their shipment of new cookbooks, entitled Lilburn Cooks Fresh. This second cookbook from the club costs $15 and is filled with recipes calling for fresh ingredients. Follow this link: LWC web site for more info on all of LWC activities and programs. Plant Sale 30% off, Friday thru Sun. April 4, 5, & 6. Fri. - Sat. 8am - 5 pm, Sun. 12-4 pm. 5444 Lawrenceville Hwy. 770-921-6485. Michael and Jimi Taylor are retiring from Taylor Made Gift Baskets after 25 years of providing the perfect gifts for families, individuals and businesses. It has been a successful and fulfilling journey. We humbly thank so many folks for our success and especially the opportunity to make new friends daily. Travels, gardening, spending more time with 2 beautiful granddaughters and just “hanging” out in Lilburn are a few items on their bucket list. Michael and Jimi love the gift industry and will continue teaching and consulting in destinations that are appealing and fun. Taylor Made Gift Baskets will remain in the same location with a new owner. The great customer service and gift baskets you have received for many years will remain with many new additives. A full service of embroidery and monogramming will be available on site. We are excited to turn the business over to a local Lilburn resident Wanda Stidham. Wanda is a native of Atlanta and graduated from Georgia Tech with a degree in Management. She has 15 years experience in the gift industry. Wanda lives in Lilburn with her husband and 4 children. Again we thank everyone for making this a wonderful journey. We will now see you around Lilburn. From LL: A big thank you to the Taylors for their many years of supporting non-profit fundraising with numerous gifts to silent auctions school functions. They have both been involved residents in many organizations and boards, and our community is thankful they are remaining in Lilburn. The CID is accepting qualifications from consultants to provide design and planning services to complete the Lawrenceville Highway Urban Design Implementation Study. The study area includes slightly more than four miles of Highway 29 from Rockbridge Road to Ronald Reagan Parkway. The CID will gain a detailed plan for improving the roadway, bicycle and pedestrian environment through better sidewalk connectivity, signage and streetscape enhancements. CID Executive Director Gerald McDowell said the study is an important part of over-arching efforts to produce a "Boulevard of Opportunity" throughout the greater Lilburn community. 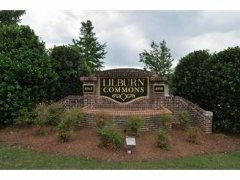 "This study will expand on the exciting initiatives already underway as part of the City of Lilburn's new town center and many other planned improvements," McDowell said. "We will produce a comprehensive guide that covers not only what needs to be accomplished, but also partnership and funding strategies to complete the work." Interested design and planning professionals are encouraged to access complete details about the study through postings on the CID's website - www.lilburncid.com - and the bid section of the Georgia Local Government Access Marketplace atwww.glga.org. Qualifications must be submitted to the Lilburn CID by no later than 2 p.m. on Friday, April 18 to be considered. Note from LL: While you are on the site, check out the other great events at EHC for Spring Break fun. April 4 from 6:00pm to 8:00pm. 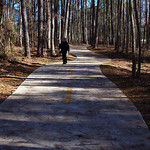 Enjoy an easy, guided educational hike on a natural surface trail in one of Gwinnett's great parks. All ages are welcome. The cost is $5 per person. Pre-registration is required. Jones Bridge Park, 4901 East Jones Bridge Road in Norcross. Pre-register here or call 678.277.0920 for more information. April 10 from noon to 1:00pm. Learn about the many vegetables that can be grown in your area and how to care for them to produce a bountiful harvest. There is no charge to attend this class, but pre-registration is required by April 8. Gwinnett County Cooperative Extension, 750 South Perry Street in Lawrenceville. 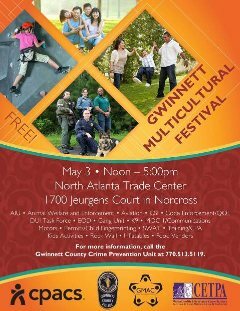 To register, contact Timothy Daly at timothy.daly@gwinnettcounty.com or 678.377.4010. April 10 from 7:00pm to 8:00pm. Everyone has that closet or shelf in the basement or garage with bottles of chemicals from years ago. Some chemicals can be harmful to you, your family, and the environment. Attend this workshop to learn some strategies for handling and storing these types of household chemicals, as well as ideas for safe and environmentally friendly disposal methods. Gwinnett Justice and Administration Center Auditorium, 75 Langley Drive in Lawrenceville. For more information and to register, email the Stormwater Management Division atdwrswreg@gwinnettcounty.com with your name, address, and phone number, or call 678.376.7193 and press 5. April 11 from 6:00pm to 7:00pm. Dads will enjoy spending time with their little sweethearts as they dance and enjoy desserts and punch in the Superior Court Ballroom. Keepsake photo and crown is included. Open to children ages 4 to 11 and the cost is $11 per person. 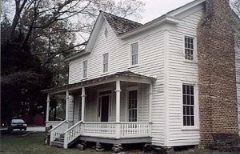 Gwinnett Historic Courthouse, 185 West Crogan Street in Lawrenceville.Pre-register here by April 7 or call 770.822.5450. Gwinnett County Administrator Glenn Stephens has announced his intention to fill three senior management positions and name a new chief financial officer. The four appointments name current community services director, Phil Hoskins as the new deputy county administrator. Current finance director, Maria Woods, will gain the title of CFO. The corrections department will be led by Darrell Johnson, who will permanently fill the position of warden. Lastly, Gwinnett’s new information technology director will be Abe Kani who comes to Gwinnett County Government from eNovation, Inc., where he served as a project executive. The agenda for next Tuesday’s commission meeting includes ratification of the employment agreements. The Gwinnett County Board of Education continues a series of five Area Board Meetings this week designed to give the community the opportunity to learn more about the school system and offer their own input. Each spring the School Board goes on the road to meet in each member’s district. The meetings also will feature Superintendent J. Alvin Wilbanks’ annual address on the state of the school district. The Board meetings are scheduled by electoral districts, but the public is invited to any of the sessions. They are all scheduled for 7 p.m. in each school’s theater. Three meetings remain, and the District 2 meeting, which includes Berkmar and Parkview School Clusters in Lilburn, will be hosted by Shiloh HS on April 15. District 2 (Daniel Seckinger), Central Gwinnett High, April 1. District 3 (Dr. Mary Kay Murphy), Norcross High, April 3. District 4 (Dr. Robert McClure), Shiloh High, April 15. It is always great to win at State and then get an invitation to compete at the national level. At the national level, a school not only brings recognition to itself, but also to its community. 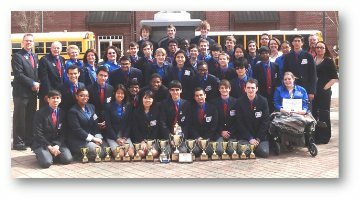 In this case, the Berkmar Academic Decathelon team, whose history at winning national recognition has been phenomenal (7 times State Champion and 12 times Division I Champion), has been invited to participate at the National Academic Decathelon Competition which will be held in late April. Already the team has raised a significant amount of money, but with just winning the berth in February and the National Competition to be held in late April in Hawaii, it doesn't allow much time to raise funds to cover expensive air fare for required chaperones and team members. The team is reaching out to the community to help them raise the remaining approximately $5,000 needed to make the trip. The PAGE Foundation website has a page dedicated to helping the Berkmar team raise this last bit of funding. Please help with any amount. Go to: http://www.pagefoundation.org/berkmar and be sure to indicate the funds to be directed to Berkmar HS. Thank you in advance as they will bring home honor not only to Berkmar, but also to our Lilburn community. Special registration forms for drivers education classes can be picked up outside the Community School Office located in Building M. These forms are also available online. During the school year, classes meet from 4 - 7 PM Monday-Thursday for 10 school days. During the summer, classes meet for 4 days from 8 AM - 4 PM Monday-Thursday. At the conclusion of the classroom portion, students will have scheduled appointments to complete 6 hours of behind the wheel instruction. A photocopy of the student's learners' permit, the completed application, and $345 fee is due no later than one week before class begins. Enrollees can also practice their driving skills on the Community School's driving simulator. Dates and price are subject to change. The next sessions are: April 14-29, June 2-5, June 16-19, and July 14-17. Parkview Community School offers a wide-range of activities for all ages. For a complete list of classes AND summer camps, go to the office or look online at http://parkviewcommunityschoolonmycalendar.com. For GCPS Community School information, CLICK HERE. To be added to Parkview Community School e-mail, please e-mail us at: parkviewcs@yahoo.com. Congrats Parkview Technology Student Assoc. The Technology Student Association state competition stage erupted into hysteria this year with all the Parkview students screaming from excitement. For the first time in the school's history, Parkview High School's TSA became state champions. Parkview TSA has been paving a road to success, having placed just behind first place Monroe Area for the past few years and placing top five for the past sixteen. Without the hard work of their dedicated advisor, Terry Cotton, and the officer team, the state title would not have been possible. Parkview TSA intends to continue the hard work to hopefully bring home success at the Nationals Conference in Washington D.C. this summer. CLICK HERE for a complete list of Parkview TSA winners. The Helping Others Organize Kreative Everyday Differences (HOOKED) Teen Club has planned a 5K and Fun Run event with the goal of bringing attention to underage drinking, encourage peers to thrive and keep adults from providing alcohol to minors. The “Alcohol Free Gets Me …” 5k and Fun Run will be held on April 26 at Tribble Mill Park at 7:30 a.m. during Alcohol Awareness Month, which is also peak prom and graduation season. All proceeds of the race will support the Teen Institute through Gwinnett United In Drug Education (GUIDE, Inc) and the HOOKED Teen Club, the club is currently seeking corporate sponsorship. “My fellow teens and I feel this race is important because it gives our community a chance to get out on a Saturday morning, meet new people and potentially find a new hobby.” Said Kyra Keenan, HOOKED Teen Club President. ”We believe if we give our peers a healthy outlet, they are less likely to drink or get themselves into other forms of trouble.” This race is organized by teens that have chosen to be alcohol free in an effort to show other teens in the community there are peers that support the choice to be alcohol free. The facts are startling for underage drinking: 25% of Gwinnett high school youth report binge drinking and alcohol use among youth is much higher than drug use. 30% of Gwinnett high school youth who drink get alcohol from parents or other adults. Youth allowed to drink at home are likely to drink elsewhere because they believe they have their parents’ approval. Youth who drink before age 15 are four times more likely to develop alcohol problems as an adult. Underage drinking can harm brain development and lower brain capacity. Tribble Mill Park is located at 2125 Tribble Mill Parkway, Lawrenceville GA. Runners can pre-register for $25 before April 12 and $30 after by calling 678-277-0900 or online at http://tinyurl.com/lejbxoj. Register by April 12 to guarantee a t-shirt, goody bag and snacks. Awards will be given out for the top three runners in each category. - GUIDE Press Release, March 20, 2014. Dream House for medically fragile children is hosting its 11th annual Golf Tournament on April 24 @ 1:pm. Go to this LINK for sponsorship and registration information. Please feel free to forward this newsletter on to neighbors and friends. Please click this LINK to find a translatable newsletter. Wed. April 3 - Start Walking Now Day. Sat. April 5, Rabies Clinic, 9-noon, Overflow Parking Lot, 76 Main St, SafetysmartLilburn.org. Sat. April 19, 9 am - noon, grounds clean up at Wynne Russell House at 4685 Wynne Russell Drive in Lilburn. Sat. April 26, 10 - 2pm, Great American Clean-up, City Parking Lot. See article on recylables. Sat. April 26, Teen Awareness on Underage Drinking Fun Run, Tribble Mill Park. More info in article below. Tues. May13, 8:15am-9:30 Lilburn Community Partnership Board meeting, CID office @ 4566 L'ville Hwy, Suite 220.